I say inspired because since I really got to looking at the book, I thought that the author had lost her mind. The entire play mat is made on a base of latch hook rug canvas. It is hooked and embroidered into the rug. I had Henry draw out the portions I thought I’d like to have and then we sat down to watch a movie with the girls while I started the embroidery on the pond. I worked for an hour and then Henry worked for the second hour with very little to show for the time invested. I was getting vey discouraged when henry said….how about cutting up some Goodwill sweaters. EUREKA! I went to Goodwill yesterday and scored some great fabric that had no business being worn in the style in which they were made….so no great fashion has been harmed in the making of this object. 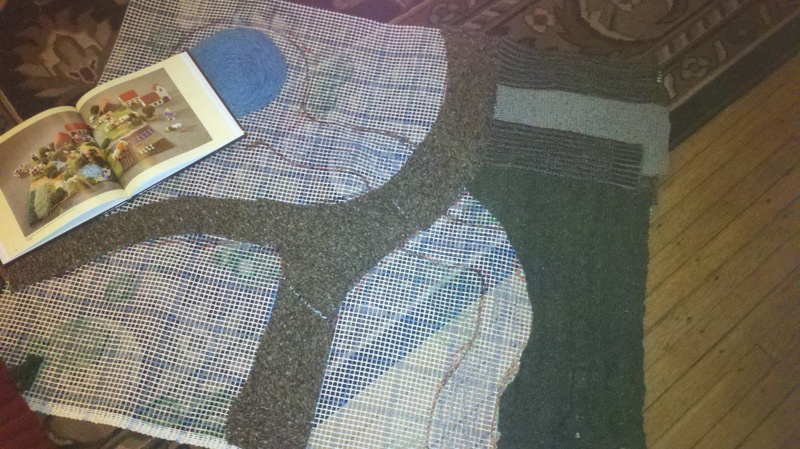 I have started piecing together the different sweater fabrics. I will still have to latch hook bushes and maybe a field, but most of this will be a lot less labor intensive than I first planned. The part that will be challenging is getting enough various little animals and people made. I have several friends at school who have volunteered to knit something and one friend had volunteered to needle felt some animals for the farmyard. 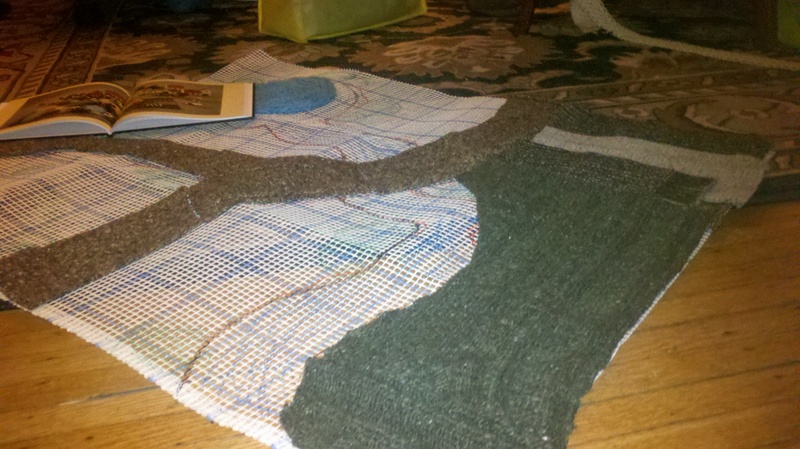 I think the mixture of fiber crafts will make this project even more interesting than I originally thought. I hope that it brings in some money for the school as well. I plan to keep you updated for the next month on it’s progress…it should be interesting. This entry was posted on January 16, 2011 by slippingthroughmyfingers. It was filed under family, knitting and was tagged with family, knitting.